Approved & available in the Downloads section. Firstly I wanted to say few words about my models. The "old" ones that are available on my website in PNG format were made in MS Paint in 300dpi, because I wanted to make them very detailed as I can make them. The "new" ones in PDF format were made in Corel Draw 9 and simple rescaling them is not a problem for me. So if anybody needs some of my models in different scale just send me a message. But for me bigger model needs more details, so it would be more work and for me paper modeling recently is on a "siding" and on the "main tracks" is my station in TT, so it can take me a long time to make them. But now after over 2-years break I've made some completly new models of two-axle freight cars from the Upper-Silesian Narrow-Gauge Railways in H0e scale. I've also uploaded modernised locomotives WLs50 made in Corel and few repaints made but @cut 'n' paste. They're all available to download from my website. ......But now after over 2-years break I've made some completly new models of two-axle freight cars from the Upper-Silesian Narrow-Gauge Railways in H0e scale. Brilliant, Sebastian! Looking forward to getting those! That's brilliant, Sebastian! Thanks! Are those wheels paper ones, or metal wheel sets? Those are good photographs of the models. At first it looked like you were showing actual railcars to give an idea of what the models are being developed from, but closer examination reveals those are photographs of the models. Very creative. Yeah - that's why I thought those must be proprietary metal wheel sets, but on closer inspection, I think they're the paper ones. I'm not absolutely certain, but from measuring the parts on the PDF, I think these are intended for 12mm track (TT) but could be adjusted for 9mm (OO9 or HOe). Is that right, Sebastian? In any case, I bet with a little work it would be possible to fit metal/plastic wheel sets and actually run these on a layout. There's a hell of a lot of detail in these models! Brilliant job! 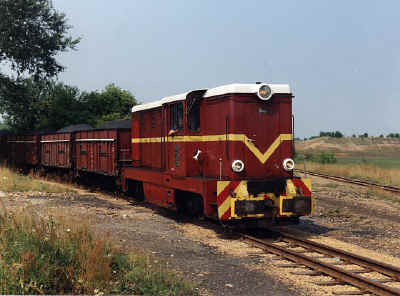 From looking at the Upper Silesian Railways website - Upper Silesian Narrow Gauge Railways - it appears that they run an LXD2 loco, which would be easy to make as a paper model in this scale. I've got hold of some drawings, so I'll have a go at that as soon as I can. Last edited by cut 'n' paste; 01-09-2017 at 10:38 AM.